The Fleming Museum of Contemporary Science is housed in the Biomedical Sciences Research Centre “Alexander Fleming” (BSRC Fleming) in Vari, Attica. The core of the Museum is Alexander Fleming’s original archival material and personal effects, which were donated by Amalia Fleming and include photographs of the actual Petri dishes on which Fleming discovered penicillin, a turning point in 20th century pharmaceutical science. These archives will provide the basis for the presentation of modern scientific thought and technology through the Museum’s exhibitions. A significant advantage of the Museum is that it will operate on the premises of BSRC Fleming, a center performing cutting-edge research in the biomedical sciences. Prizes, awards, photographs and correspondence § Material about Amalia Fleming. 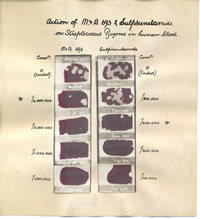 to evaluate its scientific relevance and to publicise Alexander Fleming’s unique achievements. The Museum, which is the only science and biomedical research museum in Greece housed in a research centre, will attract visitors from diverse backgrounds, such as school children, university students, researchers and the general public. Through the selection and use of innovative new technologies (multimedia), a major emphasis will be placed on education, engaging visitors of all levels, and encouraging them to take an active part in learning about biomedical research and technology and their applications. The Museum will actively be involved in Science and Society projects and will organise cultural and scientific events in Greece and abroad. 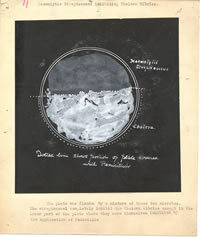 It is currently developing collaborations with well known international museums and institutions, such as the Science Museum in London and the Cité des Sciences in Paris, and is already planning joint events with the Alexander Fleming Laboratory Museum at Saint Mary’s Hospital in London, the Royal Academy of Sciences and the Nobel Museum in Stockholm. 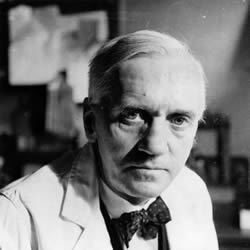 Alexander Fleming was born in Lochfield, Scotland on 6 August 1881. He studied medicine at Saint Mary’s Hospital Medical School, University of London. 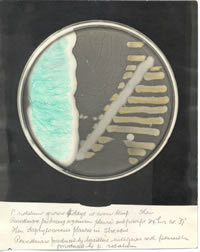 In 1928, while conducting research on pathogenic bacteria of the Staphylococcus family, he noticed that one of the laboratory cultures had been contaminated by a fungus, and that bacterial growth had been inhibited. He then examined the fungus and discovered that it contained a substance which, even when greatly diluted, prevented the bacteria from growing. He called this substance penicillin, since the name of the fungus he was working on was Penicillium notatum. A powerful new weapon against contagious diseases had just been born: antibiotics. For his contribution, Fleming was knighted in 1944 and a year later was awarded the Nobel Prize for Medicine. The name of Alexander Fleming became famous all over the world and will remain in history as the man who discovered the cure for diseases such as syphilis, pneumonia and meningitis. His second wife, Amalia Koutsouri-Voureka, later known as Amalia Fleming, a colleague of his at Saint Mary’s whom Fleming married in 1953, established the Greek Foundation for Basic Biological Research “Alexander Fleming” and created the conditions to set up the Biomedical Sciences Research Centre “Alexander Fleming”. The exhibits can be viewed during normal working hours, with prior arrangement with the director of the Center.